At last April’s General Conference, President James E. Faust (Second Counselor in the First Presidency) talked a bit about ministering angels (see “A Royal Priesthood”). To understand President Faust’s comments, it’s important to first recognize that the LDS view of angels is different from the historic Christian understanding. According to the Bible, angels are created by God as angels–a specific created creature (see Psalm 148). Mormonism, on the other hand, teaches that angels are the spirits of human beings. Generally speaking, according to Mormonism, the angels who interact with people on earth are the spirits of human beings who have died and now reside in the Spirit World (see LDS Bible Dictionary, “Angels”). For example, in Mormonism the angel Michael is Adam, and the angel Gabriel is Noah. 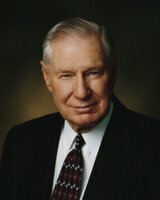 Indeed, there are many stories within Mormon circles that relate appearances of the dead to the LDS living. Many of these experiences take place in Mormon temples; Latter-day Saints consider each one sacred. Christians have long been concerned over the way Mormons welcome and treasure communication with their deceased friends and loved ones, for God makes it abundantly clear that we are to have absolutely nothing to do with communing with the dead. He calls this behavior–and anyone who practices it–an “abomination” (see Deuteronomy 18:9-14). He says that by engaging in this forbidden pursuit people “prostitute” themselves, become “defiled,” and cause God to set His face against them (see Leviticus 19:26, 31; 20:6). So the Mormon belief that it is a good thing to communicate with the dead raises red flags for Christians. But wait; there’s more. As expressed above by President Smith, Mormons are taught that the dead who appear to them are sent by God, to complete a God-given mission; to bring them messages from the Divine Presence, messages of warning and instruction. Jesus’ parable of Lazarus and the Rich Man (Luke 16:19ff) casts doubt on God’s willingness to allow visits between the dead and the living. The parable says, “They have Moses and the prophets; let them hear them.” Nevertheless, Mormon doctrine continues to encourage communication between the living and the dead. But wait; there’s still more. For Bible-believing Christians, this raises the question: What “gospel” is this? How can something so emphatically denounced and forbidden by God in His Word be promoted as “an important part of the gospel”? So is communing with the dead an “important part of the gospel”? Is it a correct principle according to the Scriptures? You be the judge. This entry was posted in Bible, Gospel, Mormon Temple. Bookmark the permalink. I quote So is communing with the dead an “important part of the gospel”? Is it a correct principle according to the Scriptures? You be the judge. The Bible is very clear, we are not to seek counsel from the dead. That was one of many verses. Read also the accout of the Rich man speaking to Lazarus. Luk 16:26 And beside all this, between us and you there is a great gulf fixed: so that they which would pass from hence to you cannot; neither can they pass to us, that [would come] from thence. Once we are dead we cannot return. I quote Mormonism, on the other hand, teaches that angels are the spirits of human beings. Generally speaking, according to Mormonism, the angels who interact with people on earth are the spirits of human beings who have died and now reside in the Spirit World (see LDS Bible Dictionary, “Angels”). For example, in Mormonism the angel Michael is Adam, and the angel Gabriel is Noah. If angels were once humans that became angels after death, then How do The LDS handle these verses here. Hbr 1:4 Being made so much better than the angels, as he hath by inheritance obtained a more excellent name than they. Hbr 1:5 For unto which of the angels said he at any time, Thou art my Son, this day have I begotten thee? And again, I will be to him a Father, and he shall be to me a Son? Hbr 1:6 And again, when he bringeth in the firstbegotten into the world, he saith, And let all the angels of God worship him. Hbr 1:7 And of the angels he saith, Who maketh his angels spirits, and his ministers a flame of fire. Hbr 1:8 But unto the Son [he saith], Thy throne, O God, [is] for ever and ever: a sceptre of righteousness [is] the sceptre of thy kingdom. God is clear, man was not and never will be angels. Otherwise God lied, because he never exalted one of his angels to become his son. Job 38:2 Who [is] this that darkeneth counsel by words without knowledge? God asked Job where he was when He (God) Did all of this. God points out in verse 7 that the angels were with him, but not man. God created angels before man. Man was not first, then turned into an angel. Also if mormonism teaches their are 3 levels to heaven, then where do human/angels fit in?